The READ RUSSIA PRIZE Jury is pleased to announce the winner of the 2018 READ RUSSIA PRIZE for the best translation of Russian literature into English! The awards ceremony for the 2018 READ RUSSIA PRIZE was held during the 2018 London Book Fair on Wednesday, April 11 at Waterstones Piccadilly (203 – 206 Piccadilly), London, UNITED KINGDOM. 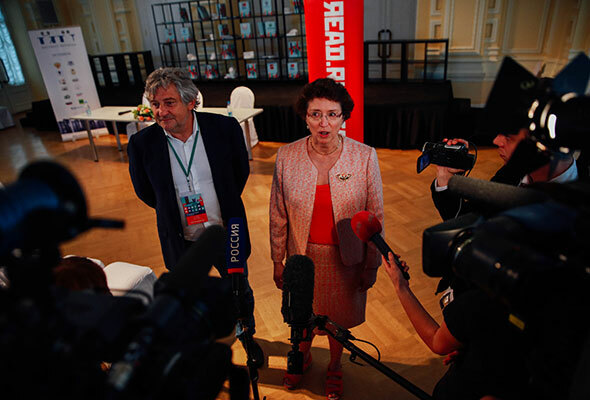 The READ RUSSIA PRIZE is awarded for works of Russian literature published in new English translations. 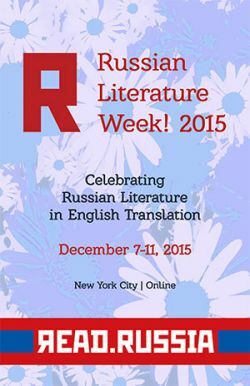 All publishers of Russian literature in English translation may submit published works. Winners receive an award of up to $10,000, divided at the discretion of the Prize jury between the translator(s) of the work and the English-language publishing house. Previous winners include Oliver Ready, for his translation of the novel Before and During by Russian author Vladimir Sharov (Dedalus Books) and Joanna Turnbull and Nikolai Formozov for their translation of Autobiography of a Corpse, a collection of tales from Russian writer Sigizmund Krzhizhanovsky (New York Review Books). Kevin M. F. Platt is Edmund J. and Louise W. Kahn Term Professor in the Humanities and Professor of Slavic Languages and Literatures at the University of Pennsylvania and a translator of Russian poetry. Donald Rayfield is Emeritus Professor of Russian and Georgian at Queen Mary University of London, translator of Russian and Georgian works, and the author of, among other works, A Life of Anton Chekhov, Edge of Empires: A History of Georgia, and Stalin and His Hangmen. Anna Summers, a Moscow native, received her Ph.D. in Slavic Literatures from Harvard, has taught at Syracuse, Harvard, Boston College, Brown, and MIT, and has been translating Ludmila Petrushevskaya, Nikolai Gogol, Andrei Platonov, and other Russian authors for more than twenty years. Like the memoirs of many other White Russian émigrés, Teffi’s travelogue is saturated with a melancholic nostalgia for a country and a way of life abandoned forever. At the same time, every page sparkles with irony and humor. This humor lifts the memoir beyond self-pity and fruitless mourning. Although Teffi’s brand of subtle humor – both self-deprecating and sly – tests the translator's skills, especially when, as here, it undergirds a great tragedy, Robert Chandler’s translation rises to this challenge, successfully negotiating the border between a gentle smile and a bitter tear without sounding either gruesome or overly jocular. Besides melancholy, an overwhelming terror permeates Teffi’s humorous vignettes. Early in the book, we meet the fearful Commissar H., a self-proclaimed lover of the arts and a particular fan of Teffi’s work, on whose good graces Teffi’s escape depends. He works for the Soviet secret police, the Cheka, and to mitigate the fear his figure inspires, Teffi employs synecdoche that reduces a gruesome executioner to “a nose in boots,” in Mr. Chandler’s wonderful translation, “a rhinopod.” The terror comes through at the end of the chapter, when the commissar accompanies Teffi home – a service she must accept; she notes that none of the nocturnal dangers appears “as frightening as the giant who was my guard.” This combination of humorous tropes with undiluted fear presents another stylistic challenge to a translator, and Mr. Chandler copes admirably. Thanks to a precise and inventive labor of translation, this important moment in history, more often depicted in the key of pretentious historical drama or elegiac lament, is now presented to English readers in all of its absurdity and irony – the hallmark features of Teffi’s inimitable prose style. Russian Émigré Short Stories from Bunin to Yankovsky is a rich anthology of short stories by authors from the first wave of Russian emigration following the 1917 revolutions. This was a vast exodus, comprised largely of educated Russian elites who found themselves in Paris, Berlin, Shanghai, Harbin and other suddenly vibrant centers of diasporic Russian cultural life. Editor and lead translator Bryan Karetnyk has done a marvelous job of selecting authors and works in order to present a snapshot of the very large literary output of the emigration, including well-known figures such as Ivan Bunin and Vladimir Nabokov alongside others whose more recent rediscovery has led to a certain fame, such as Nina Berberova, as well as still other subtle and important authors whose legacies have been less fortunate, such as Irina Guadanini and Dovid Knut. 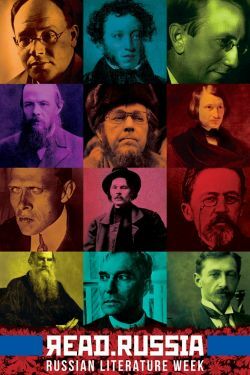 The translations, most of which were commissioned for this volume or carried out by Karetnyk himself, maintain a high standard of literary quality and precision. Admirably equipped with biographical and explanatory notes, this anthology presents to the Anglophone reader, for the first time, a unified representation of the authors and disparate, yet interlinked cultural contexts of first-wave Russian emigration. Ilia Zdanevich’s Rapture is perhaps the only piece of Russian futurist or primitivist prose to win broad acclaim, and Thomas J. Kitson’s fine version is its first English translation, reprehensibly overdue after nearly 100 years. 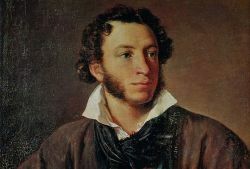 Ilia Zdanevich had a Georgian mother, lived mostly in Georgia, and effectively wrote on a typical Georgian theme, the vengeance of an outlawed and isolated bandit. The novel echoes Georgian folk epics, and yet is the climax of the Russian tradition of novels set in the lawless Caucasus. Although futuristic in its style (from abandoning punctuation to including unprintable words), the novel’s pagan narrative has the same hypnotizing effect on the reader as Stravinsky's Rite of Spring. Kitson does not put a foot wrong, in a translation so accurate and sensitive that it is unlikely to be superseded. RUSSIAN LITERATURE WEEK – 2017: A FESTIVAL OF TRANSLATION! RUSSIAN LITERATURE WEEK 2017 presents a series of panels, screenings, and in-person conversations featuring some of Russia’s most acclaimed new authors, famed translators of Russian fiction, and several of the world’s leading Russian literature scholars and literary critics. 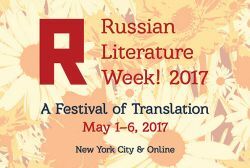 RUSSIAN LITERATURE WEEK 2017 will take place May 1-6 in literary venues across New York City including Book Culture, the Strand Bookstore, New York University, Columbia University, the Grolier Club, and the Russian Samovar restaurant – and, as always, online. Elif Batuman has been a staff writer at The New Yorker since 2010. She is the author of The Possessed: Adventures with Russian Books and the People Who Read Them. The recipient of a Whiting Writers' Award, a Rona Jaffe Foundation Writers' Award, and a Paris Review Terry Southern Prize for Humor, she also holds a PhD in comparative literature from Stanford University. The Idiot is her first novel. Russian Literature in Translation: Why These Wars? Why Such Violence? Watch this space for April updates! At the 2017 London Book Fair, March 14-16, Read Russia will showcase more than 450 new titles – with a focus on works by Russian writers whose major anniversaries are being celebrated in 2017, among them Bella Akhmadulina, Valentin Kataev, Vladimir Makanin, Konstantin Paustovsky, Marina Tsvetaeva, and Maximilian Voloshin. 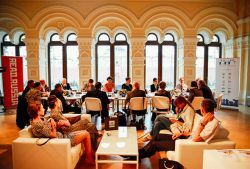 The public program will include talks and discussions with Russian writers, presentations of new translations of Russian literary works into English, and announcements of new funding opportunities for publishers and translators. Renowned British literary translators Arch Tait, Donald Rayfield, and John Farndon will present their newest works, and Read Russia will host a series of conversations with award-winning writers Alexey Ivanov, Valery Bochkov, Alisa Ganieva, Marina Stepnova, and Vadim Levental. Film screenings include “My Own Honor Bright,” directed by Alexander Karpilovsky, based on the book by Mikhail Seslavinsky; and “The Backbone of Russia,” Alexey Ivanov’s four-episode documentary series produced with journalist, television host, and director Leonid Parfenov and producer Julia Zaitseva, exploring the culture of the Urals. Read Russia events will be held at the Russian stand at Olympia and at London cultural venues including Waterstones Piccadilly and Pushkin House. The Storytellers. In Fall 2016 six British and Russian artists shared an epic journey on the Trans–Siberian Express, writing music, fiction and poetry that reflected their experiences and performing for the public along the way. Writers Joe Dunthorne and Andrew Dickson (Britain), and Alisa Ganieva (Russia) reflect on their adventure with breathtaking film footage from Arseny Khachaturyan. Organized by the British Council as part of the UK-Russia Year of Language and Literature 2016.